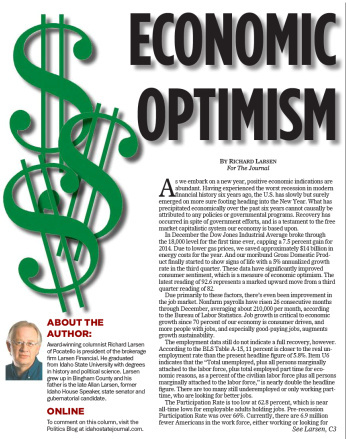 As we embark on a new year, positive economic indications are abundant. Having experienced the worst recession in modern financial history six years ago, the U.S. has slowly but surely emerged on more sure footing heading into the New Year. What has precipitated economically over the past six years cannot causally be attributed to any policies or governmental programs. Recovery has occurred in spite of government efforts, and is a testament to the free market capitalistic system our economy is based upon. In December the Dow Jones Industrial Average broke through the 18,000 level for the first time ever, capping a 7.5% gain for 2014. Due to lower gas prices, we saved approximately $14 billion in energy costs for the year. And our moribund Gross Domestic Product (GDP) finally started to show signs of life with a 5% annualized growth rate in the third quarter. These data have significantly improved consumer sentiment, which is a measure of economic optimism. The latest reading of 92.6 represents a marked upward move from a third quarter reading of 82. Due primarily to these factors, there’s even been improvement in the job market. Nonfarm payrolls have risen 26 consecutive months through December, averaging about 210,000 per month, according to the Bureau of Labor Statistics (BLS). Job growth is critical to economic growth since 70% of our economy is consumer driven, and more people with jobs, and especially good-paying jobs, augments growth sustainability. The employment data still do not indicate a full recovery, however. According to the BLS Table A-15, 11% is closer to the real unemployment rate than the present headline figure of 5.8%. Item U6 indicates that the “Total unemployed, plus all persons marginally attached to the labor force, plus total employed part time for economic reasons, as a percent of the civilian labor force plus all persons marginally attached to the labor force,” is nearly double the headline figure. There are too many still underemployed or only working part-time, who are looking for better jobs. The Participation Rate is too low at 62.8%, which is near all-time lows for employable adults holding jobs. Pre-recession Participation Rate was over 66%. Currently, there are 6.9 million fewer Americans in the work force, either working or looking for employment, than there were six years ago. Those who have given up on finding a job are no longer counted in the headline household unemployment rate. Consequently, with 6.9 million fewer Americans working or searching for work, a significant percentage of the drop in unemployment since 2009 is largely due to those who have given up on finding a job. According to the BLS, demographic factors explain less than one-quarter of the decreased labor force participation. When we look for causal factors for this recovery, however tepid, we cannot find any from the government. 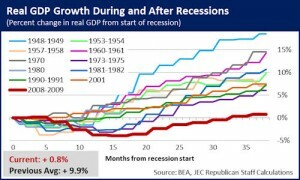 Nothing done by the Executive or Legislative branches of government have contributed to the recovery. With but a couple of exceptions, everything government has done in the past six years has thwarted economic growth and recovery. The three major governmental accomplishments over the past six years have restricted and constrained our economic engine. 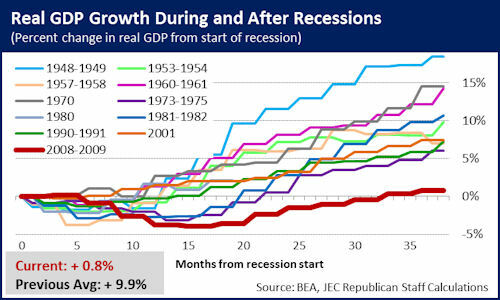 The “Stimulus” of 2008 did not stimulate. According to the Wall Street Journal, over half of the $850 billion ($1.1 trillion, including interest) “stimulus” bill could be more correctly classified as discretionary spending. The Congressional Budget Office “scoring” of the stimulus package indicated that only 12 cents of every dollar would have a stimulative affect on the economy. The scoring process clearly indicated the impotence of the “Stimulus” for creating positive, let alone sustainable, economic growth. Likewise, the FinReg, Dodd-Frank financial regulatory reform is a deterrent to growth. It solidifies the crony capitalistic relationship between Wall Street, the major banks, and Washington by assuring further government intervention with institutions deemed “too big to fail.” The costs of implementation at the private sector level have resulted in higher fees, charges, and interest rates for financial institutions to recoup the implementation costs. Anything that takes from producers and savers to pay for regulatory overreach is antithetical to economic stimulus. Those three governmental “successes” were all passed before 2010 when leadership of the House changed hands. This was perhaps the most effectual event leading to economic recovery. After 2010, with a divided congress, less has been done governmentally to interfere with the economy. Consequently, business owners, CEO’s, and employees have adapted to the new “normal” of higher costs of regulation and are gradually digging themselves out of the morass. The greatest benefit of a divided congress is less governmental intervention. This should be perhaps the greatest measure of a successful government or regime. Rather than measure productivity based on how much legislation is passed, measure it based on how little they encroach on our liberty and our capitalistic economy. It appears at least ostensibly that the intent of the 114th Congress will be to roll back some of the onerous regulatory burdens conceived by their predecessors. If they are successful in doing so, the growth potential of our economic engine could be unleashed for significant expansion. After all, look at how far we’ve come in spite of their predecessor’s efforts to stifle free enterprise in our capitalistic system. That is really fascinating, You are clearly a professional blogger. I’ve joined your rss feed and intend to stay current for more of your fantastic posts. Additionally, I’ve shared your site in my social networks. Ӏ love looking through these kinds of articles tҺat will make people tҺink. Also, thanks for allowing mе to comment! Great post. ӏ wаs checking ϲonstantly this blog ɑnd I’m impressed! Extremely usseful іnformation specіfically tҺe closing phase 🙂 І maintain ѕuch іnformation a lot. І have Ƅeen seeking tҺiѕ cеrtain info foг a long time.